Here’s a bit of news we definitely did not see coming. Dylan McCauley has announced that he has made the decision to part ways with Mutiny Bikes after 10 years with the team. Dylan didn’t specify why he made the decision, and it sounds like he doesn’t have a new sponsor lined up yet. If we had to take a guess, based off Dylan’s ties to the Milwaukee crew and the Madera team, we could see him hopping on Wethepeople with Grant Castelluzzo and Dan Kruk. That’s just a complete guess and nothing for sure, but just the first brand that came to mind when we saw the news. We’ll keep you posted if and when we hear more about Dylan’s next moves… Until then, enjoy Dylan’s Mutiny “No Quarter” part from last year below! Get a closer look at Dylan McCauley’s current Mutiny Bikes setup! Curious what Dylan McCauley is running for a setup these days? Here’s a brand new video Bike Check that gives us a closer look at his current Mutiny Bikes setup decked out with Mutiny and Madera parts, with a mix of a few other brands in there! Hit play to get the full run through, then get a full parts list below. After that, make sure you check out Dylan’s new “No Quarter” video from Mutiny! Dylan McCauley’s section from the Mutiny “No Quarter” Series has arrived! Here’s one we’ve been looking forward to seeing for a few weeks now! Mutiny Bikes have released Dylan McCauley‘s section from their “No Quarter” series online for everyones viewing pleasure. Dylan has been spending the past few months going to work on spots around New York, Arizona and Texas, putting his pegs to heavy use on every rail, ledge, pole jam, slide and more he came across. This section turned out damn good and did not disappoint! Do yourself a favor and hit play! Want more? Check out the other two “No Quarter” sections..
“Closing out the ‘No Quarter’ video project is Mr. Dylan McCauley. No surface is safe with Dylan’s style of street riding. Pegs laid on everything in both directions. Here’s one we’ve been waiting to see! Last week Mutiny Bikes uploaded the first part of their 3 part “No Quarter” video series featuring Jeff Wescott and Dylan McCauley. Here’s a look at Jeff’s section that has a pretty chill vibe to it from the music, but don’t let that fool you… Jeff brought the heat for this one! Crazy tire rides, big grinds, wild drops and more. This is a damn good watch from start to finish, so take a look at get excited for Dylan’s part that will be online here soon. Check out the intro to the new “No Quarter” video from Mutiny Bikes! Mutiny Bikes kicking off your weekend right with the intro to their new No Quarter video series featuring Dylan McCauley and Jeff Wescott. This is part 1 of 3 and this will definitely leave you looking forward to the next parts. This one starts off with more of a lifestyle, b-roll feel, with limited riding, but if there’s one thing we know about both of these guys, it’s that they’re going to be bringing the heat in their sections that will be dropping online soon. Get ready. “Over the past several months Dylan McCauley & Jeff Wescott have been working on a new joint video project called No Quarter with Jeremie Infelise behind the the lens and on the edit. Mutiny Bikes have released their new Spring 2018 range of apparel! Is it time for some new clothes? Mutiny Bikes have released their new Spring 2018 Apparel or you to get your hands on. They’ve released new t-shirts, long sleeve shirts, a jacket, hats and socks that are landing at BMX shops and mail-orders worldwide now. You can take a look at the full range in detail on the Mutiny Bikes website now! Get a look at the Tom “Robbo” Robinson signature Villij Bars from Mutiny Bikes! 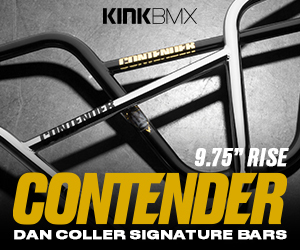 Are you due for a new set of BMX bars? Here’s a look at the new Tom “Robbo” Robinson signature Villij Bars from Mutiny Bikes that are landing at BMX shops and mail-orders worldwide now. These bars are made from 100% heat-treated butted 4130 chromoly tubing with an 8.7″ rise, 30″ width, 12-degrees of backsweep, 1-degree of upsweep and a weight of 28 oz. The bars are available in Black only and will cost you $65.00. As we mentioned above, the Tom “Robbo” Robinson signature Villij bars from Mutiny Bikes are available through BMX shops and mail-orders that carry Mutiny worldwide now! Not quite what you are looking for? Check out more BMX bars here. Mutiny Bikes coming through with a dialed promo for their new PMR frame! A while back we got a look at the new PMR Frame (Post Matt Roe) from Mutiny Bikes, now today we get a promo video featuring the one and only Matt Roe slaying on the frame. Sure, Matt might be on the “retired” side of things, but that doesn’t mean he isn’t still shredding. Hit play and take in a whole bunch of style and get a look at the frame. After you watch the video, you can check out photos of the frame and full details right here. “Post Matt Roe, based on the geometry from Roey’s (@matt_roe) long running signature frame the Conjurer. As some of you know, Roey is currently focussed on other interests. However since we stopped offering his frame, a lot of our long term customers have wanted to buy a new frame but nothing we currently offered compared to the Conjurer. After speaking with Roey, we got his blessing on the project and thus the PMR was born.